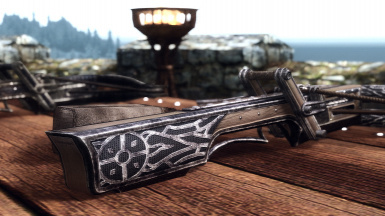 You can use all parts of this mod freely as long as it stays on Nexus and you credit my work in the comments. 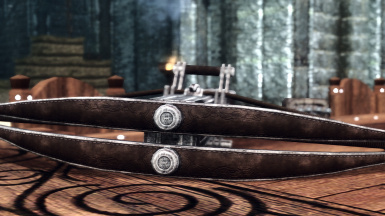 This mod requires DAWNGUARD dlc! 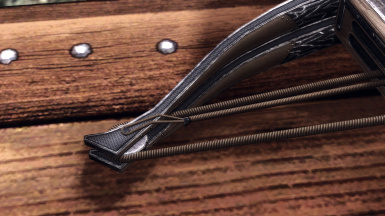 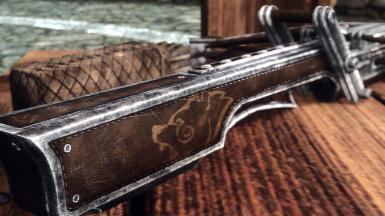 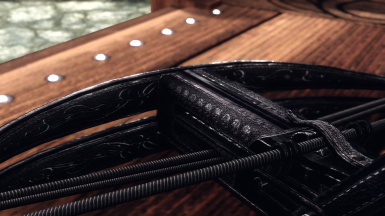 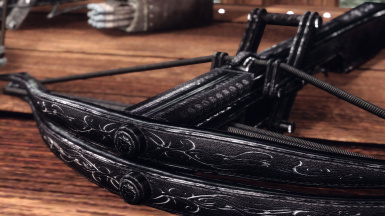 To be able to craft the crossbows read the instructions in the crafting manuals! 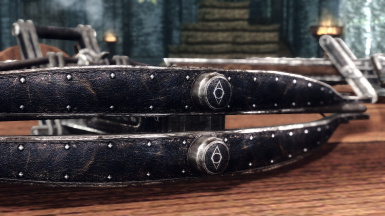 Companions, Dawnguard, Dark Brotherhood, Thieves Guild, Imperial Legion and Stormcloaks. 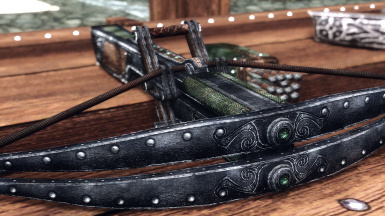 Although I wanted for some time, only recently I purchased the Skyrim dlcs and I was so anxious to use the crossbow since its one of my favorite weapons in any game. 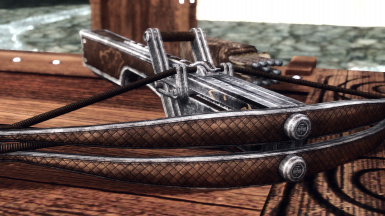 The weapon itself is fantastic but the lack of variety really surprised me! 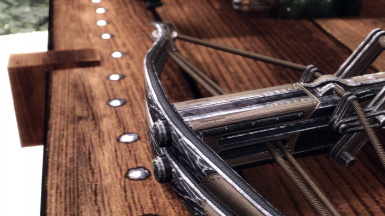 So I started my own little project to add more crossbows and integrate them to the game in a way that they would appear to be part of it and as much lore friendly as possible. 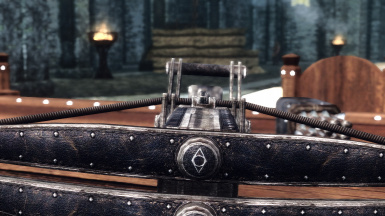 Two years have passed since the discovery of a strange ancient technology by the Dawnguard that gave them the edge in combat and helped them contain the alarming increase of Vampire population. 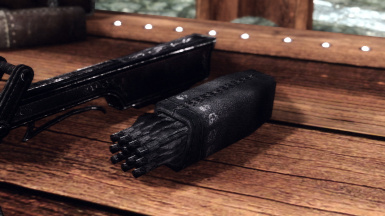 At first they tried to conceal it but their increasing expenses by their crusade against the blood-drinkers forced them to seek new sources of income. 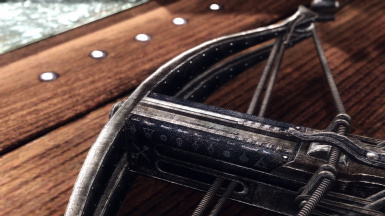 Very reluctantly and after a close vote they decided to offer their new discovery for sale. 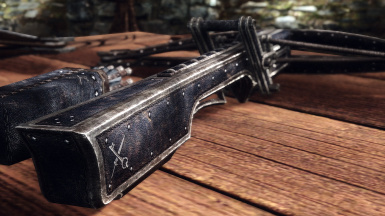 They redesigned and refined their weapon to present it to their fist probable customer, the Imperial Legion. 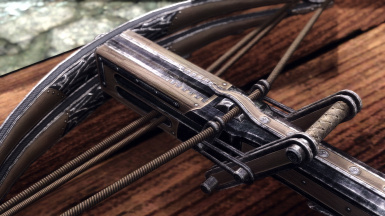 Thus the Dawnguard Crossbow was born. 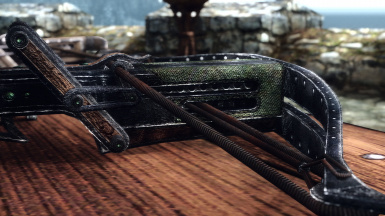 The Legion commanders were thrilled with the prospect of having such a powerful weapon at their disposal but the cost was extreme so they asked for a simpler version with cheaper materials that could be easily mass produced. 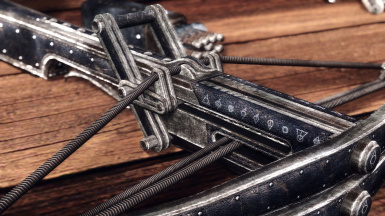 The deal was signed and as a result now every new recruit trained in archery has the option to choose an Imperial Crossbow as his/her weapon. 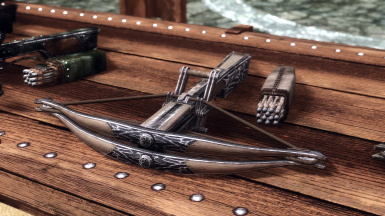 After suffering many losses and with their morale deteriorating many Stormcloak soldiers started using the crossbows of their fallen enemies in a desparate attempt to even the play field. 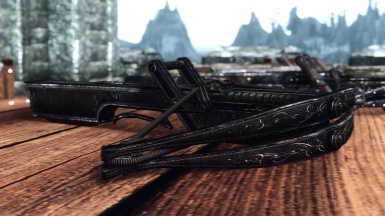 In a random inspection Ulfric Stormcloak became furious when he saw his soldiers using weapons with the Imperial insignia on them and swiftly banned their use. 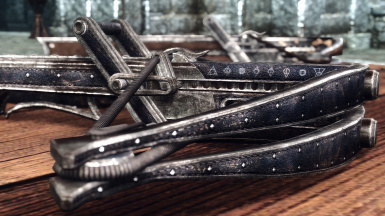 Soon after though and after counting his losses, he ordered his blacksmiths to gather and modify these deadly weapons to display his markings and to start distributing them among the men. 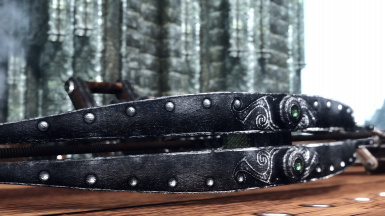 A new challenge presented to the Thieves Guild by the Dark Brothehood. 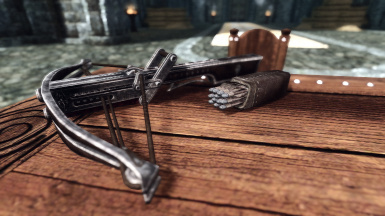 Their job was to acquire a certain blueprint to a powerful new weapon inside Fort Dawnguard no matter the cost. 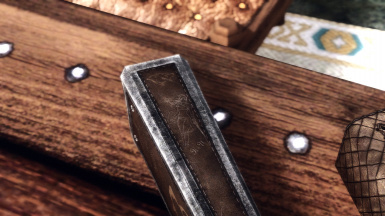 This risky job required a lot of planning and the use of the best assets of the guild and after an almost perfect execution the blueprint was in their possession. 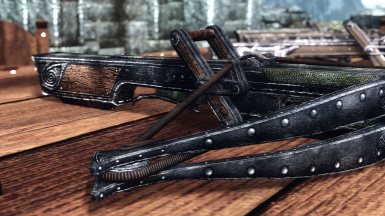 Realizing its enormous value they made a copy before delivering it to their employer and started designing their own version of the weapon. 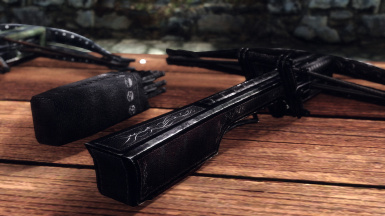 Dark Brotherhood could not stay in the shadows for long after hearing the rumors about a powerful new weapon that would clearly give an edge to their members. 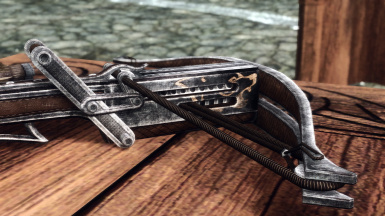 Without hesitation they offered the job and a huge reward to the Thieves guild to acquire either the weapon itself or its plans. 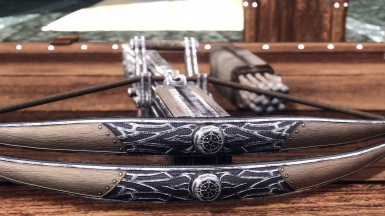 The Companions, mostly unaware of the new weapon everyone was after, made a chance discovery while exploring an ancient ruin. 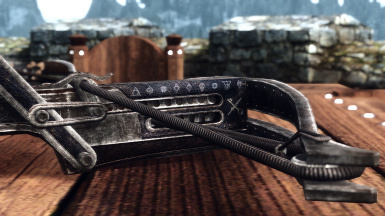 It looked like a design of an ancient weapon used by the Dwemer long ago. 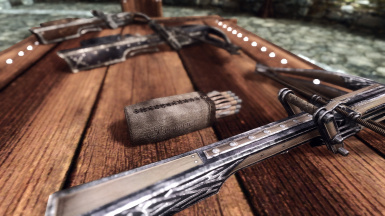 Eagerly they showed this find to Eorlund Gray-Mane, their master blacksmith whose craft is unmatched in all of Skyrim and he came up with a brilliant way to combine ancient Draugr weapon parts together to create a unique and powerful new weapon. 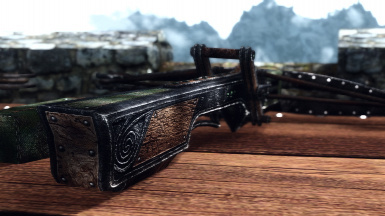 and by deleting the folders Crossbows inside the Skyrim/Data/Textures/DX/ and Skyrim/Data/Meshes/DX/ folders. 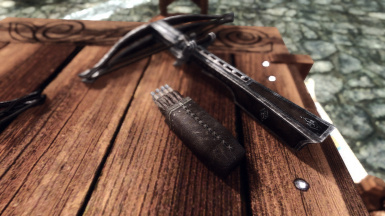 raulfin for providing the compatibility patches! 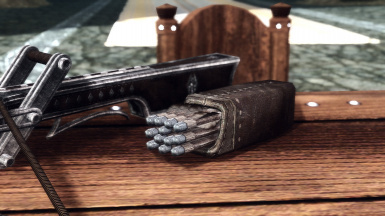 mamax59 for the French translation!